Club Purple is the place to be. What makes it so fantastic is the mysterious DJ Pardoman, who keeps his face hidden behind an ever-changing electronic mask. When a competition is announced to unmask him, everyone wants to know who's behind it. To win, entrants have to find out as much as possible about DJ Pardoman. Of course, Dinah, Lloyd, Harvey and the other SPLAT (Society for the Protection of our Lives Against Them) members want to try their hand at winning.During their research, Dinah makes a discovery on the internet-something she can't even tell the rest of SPLAT about. But when she goes off to investigate alone, she doesn't realize that she's being lured into a trap . . . set by the Demon Headmaster!Can SPLAT foil his evil plans once more? 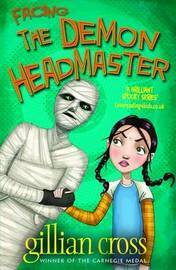 Or will the Headmaster succeed in using Dinah in his mission to control the country? The Demon Headmaster The Demon Headmaster and the Prime Minster's Brain The Revenge of the Demon Headmaster The Demon Headmaster Strikes Again The Demon Headmaster Takes Over Awards: Winner of the Carnegie Medal for Wolf Winner of the Whitbread Award for The Great Elephant Chase Winner of the Smarties Prize for The Great Elephant Chase Biographical information: Gillian Cross was born in 1945, and has written more than 40 books for children. In the past, she has worked in a primary school, as an assistant to a village baker, as a childminder, and as an assistant to a member of parliament. Gillian is a huge supporter of libraries, and for eight years was a member of the committee which advises government ministers about public libraries. She now lives in Dorset with her husband and family, and enjoys playing the piano, orienteering, and reading in her spare time.